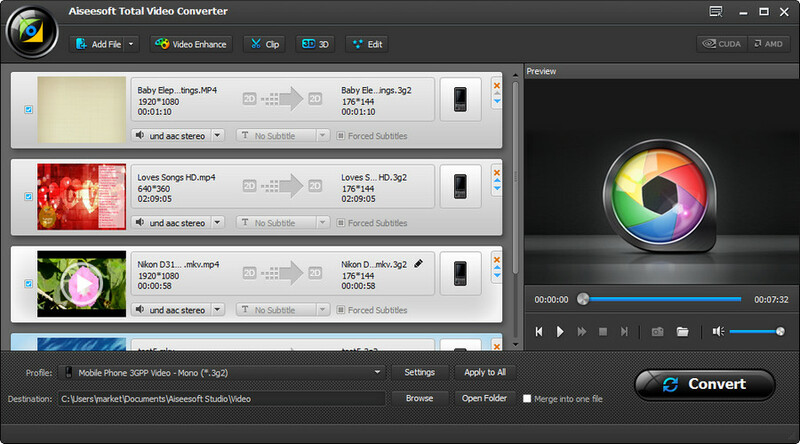 Aiseesoft Total Video Converter Platinum owns the function of both Video Converter and 2D Video to 3D Video Converter. With it users can convert all popular video and audio files to any other video(AMV ASF XviD DivX Flash H264 FLV SWF H.264 AVI MKV MOV H.264MPEG-4 AVC M4V MPEG-4 MPEG-1 MPEG-2 MPEG-4 MTV VOB WMV AVI DV VCD WebM HD video) and audio(AAC AC3 AIFF AMR MP3 MP2 M4V FLAC OGG AU WAV WMA) formats. Also it allows users to convert general 2D video files to MP4 MKV TS AVI and FLV 3D videos. Key Features1. Convert any 2D video to 2D3D videoIt allows you to convert any popular 2D video to 2D3D formats easily.2. Support five 3D modesIt supports five 3D modes: Anaglyph (Redcyan) Side By Side (Full) Side by Side (Half-Width) Top and Bottom (Full) Top and Bottom (Half-Height).3. Merge files togetherMerge several video or audio files into one file.4. Trim video or audioTrim a video or audio to your desired time length segments by setting the start and end time.5. Crop Frame Size Cut off unwanted playing areas of a video to fit your different portable players.6. Add Video WatermarkPersonalize your video with the image or text watermarks and adjust its position transparency etc.7. Set output videoaudio effect This software enables you to define the output video or audio parameters such as Video Encoder Frame Rate Video Bitrate Resolution and Audio Encoder Sample Rate Channels Audio Bitrate. Also you can adjust the video effect: brightness contrast saturation hue and volume.8. All popular portable players supportedThe output files can be played on: iPhone 5siPhone 5c iPhone 5 iPad mini 2 iPad Air iPad mini iPad 4 ipod touch 5 iPod nano 7 Samsung Galaxy Note 3 Samsung Galaxy S4 HTC One X and Kindle Fire HD etc.